A little after arriving home from this trip, news began to filter through of the terrorist attacks on London Bridge and at Borough Market. It was hard to map the scenes of quiet, empty desolation on the deserted bridge after the incidents with the busily confident, confusing and bewilderingly colourful London I'd walked across just hours earlier. Whatever people of varying political stripe will tell you, London remains one of the freest and most diverse cities on the planet, and benefits to an almost unmeasurable degree from this. With this freedom comes the opportunity to change and reinvent places, communities - and even ourselves. However, along with diversity and constant change comes an ever-shifting level of equality and sometimes a sense of alienation too. But all any Londoner needs to do to be part of something bigger, something sustaining and ever surprising is to step outside and walk in their city. London isn't an inert state capital for display purposes only - it is the sometimes confusing, often gritty and ever-remarkable product of the collective striving and will of eight million individual souls - and that's exactly why it's going to be very, very hard to repress the spirit of the city. This post doesn't stray even close to the parts of London which suffered at the hands of ideologically driven, hate-filled terrorists today - but it crosses the paths of many of the people and communities who make this city the complex, bewildering and captivating place which has consumed my enthusiasm and attention for so many years. I'm moved to remember again the word carved into the southern pediment of St. Paul's Cathedral - Resurgam. I shall rise again. With a degree of childish excitement I descended to the Thameslink platforms at St. Pancras International station. I realised as I planned today's trip that I'd never caught a train from these platforms - at least not in their current incarnation. When my more regular travels fell away during the latter part of 2012, the line remained divided - with ongoing work at London Bridge and Blackfriars before it would be possible to restore the cross London link. Indeed, on some weekends even now there is no through service as capacity improvement work continues - but today I was lucky, as everything was running smoothly and trains were passing through the city unimpeded. I didn't have long to wait on the thankfully cool platforms under the main concourse for the train to arrive - a long, white, businesslike Class 700. I hopped gleefully on board for the short ride up to Hendon, thrilled to be getting a new type of train under my belt - a rare enough experience these days. If this walk had been planned or thought through with any rigour, the theme might well have been 'my nerdiest obsessions' - though I'm equally aware that could apply to almost any of my wanders nowadays. This one however swiftly progressed from trains to roads as I disembarked at Hendon where the Midland Main Line is sandwiched into a narrow gully alongside the M1 as it accelerates away from its origins at Staples Corner a little to the south. Hendon station is situated at a point where the A504 divides to begin - or indeed end, depending on one's perspective - on the A5 at a broadly looping one-way system. I decided that to properly commence this walk I needed to circumnavigate this as a sort of ritualistic beginning - so turning my back on the motorway and the station I set off downhill. Hendon is a place with multiple, distinct urban centres based around transport infrastructure - and at some point there was a busy string of stores along the A5 near the station. Now, with Brent Cross Shopping Centre a stones' throw to the south and some sizeable retail developments stretching away north along the road to Edgware, the whole area looked abandoned and dilapidated. The junction where Station Road meets the straight, broad course of Roman Watling Street is pedestrian unfriendly and confusing, traffic turning left to loop right. While here I decided to venture across to look at Welsh Harp Reservoir - a fascinating feature of the map of London from my childhood. To get to the water, where the Silk Stream and the Dollis Brook meet to form the more substantial River Brent, I had to cross a new housing development which was slowly climbing around tall cranes. But surrounding the foot of the new homes were a range of mid-century public housing blocks in a fairly surprising still clearly in use despite their disrepair. A large 'Show Home This Way' banner was stretched across the entrance to this little enclave of homes, rather pointedly amplifying the difference. A little research indicated that this was the West Hendon Regeneration project, and that the process of moving tenants out to build new homes had not always run smoothly, and had rarely served the existing tenants well. This wasn't new - and it wasn't the first such situation I'd encountered on my travels in North London - but as I watched a Police Officer go door-to-door at the old, run down flats while her colleagues meticulously searched the communal waste area, I realised that like elsewhere this just wasn't working for West Hendon - a place which had little identity and even less access to services. Thwarted by barriers and the need to 'officially' be in the new development to reach the reservoir I turned back, keen not to attract the interest of the Police this early in my walk. As I traced the beginnings of the A504 via the poorly-marked junction, back to the station, I knew I needed to come back this way at some point to unravel the waterways which marked the increasingly forbidden boundaries of this area. Realising that despite an early start to the walk I'd barely set off, I strode swiftly uphil from West Hendon, crossing the railway and the M1 again near the rather fine old frontage of the Midland Hotel. After a gritty, urban beginning the A504 soon becomes a rather typical, and certainly not unpleasant North London suburban road. This stretch is lined with decently sized brick villas, and is busy with local traffic making exactly the unremarkable local journeys that I'd imagined I'd be writing about when walking these routes. And just like all of these cross-routes, the road soon meets one of the venerable arterial routes leaving the city - in this case the wide, busy dual carriageways of the A41 heading for Watford. In fact, this road seems to carry more of the burden of city-bound traffic than the A5 which I'd crossed earlier. In the midst of the carriageways was an isolated and forlorn war memorial which I reached after a struggle through confusingly unsigned subways. The paved central island doubled as a works compound for some apparently yet-to-be-realised improvements, and it was hard to conceive this location among torrents of traffic as a peaceful place of respectful contemplation. There was a hint of a fine aspect south over the valley of the Mutton Brook below, but the overgrown trees and tangle of equipment didn't allow a good view. I headed back underground to complete my crossing of the A41 and head onwards. Altogether quieter here, the A504 takes a sharp turn to the east among the buildings which form the Middlesex University Campus. 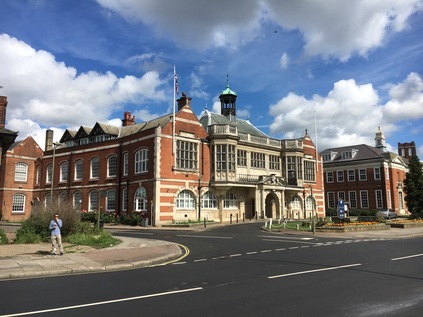 The sizeable buildings occupy a mixture of impressive newly-built accommodation and former municipal technical college premises which sit alongside the impressive civic architecture of Hendon's old Town Hall and Library. The former Middlesex Polytechnic brought together a somewhat disparate range of much older teaching institutions across North London, finally coming into some sort of coherence in 1973, but still ranged across a number of sites dotting the North Circular. In recent years, the University has settled on a strategy of centralising on the Hendon Campus, and developing some smart new buildings alongside the rather fine civic centre it occupies here. It struck me that if my orbital walks had a patron educational institution, it would be Middlesex University, its scattering of former sites marking out my recent walking territory with eerie accuracy from here to Cat Hill, Trent Park, Tottenham and beyond. 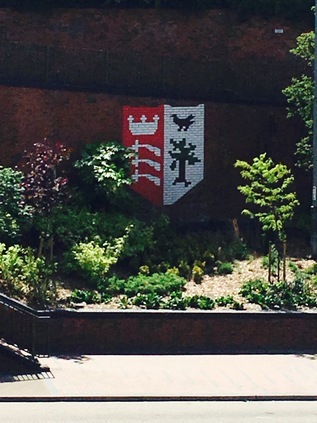 Turning my back on the large emblem of the now-defunct County, I press on eastwards into what may well be called Church End - a curiously unremarked urban centre which sits marooned in a diamond of suburbia trapped between the A41, the A1 and the North Circular. It was proving to be a hot morning so I loaded up on water before moving on, crossing the bustling crossroads of Church End and following the signs for Finchley. Plunged back into typical suburban scenes, I noted the road beginning a gradual descent into the Dollis Valley. Ahead of me, a tree-lined ridge indicates a climb beyond which I'll need to tackle soon - but for now I focused on the crossing of the 'new' 1920s alignment of the A1 in the valley below. The road network of North London uses the geography of waterways as a framework, fitting into the harder to develop valleys and gullies the brooks and rivers have formed over millennia. In particular, the confluence of the Dollis Brook and the Mutton Brook provides the opportunity for the A1 and A406 to entangle in the messy, complexity of Henley's Corner. The waterways have had their last laugh perhaps though, as this complicated and congested junction is now hemmed into the confines of the site, and very hard to modernise or expand. My route crosses the A1 north of this tangle, in a rather gloomy hollow at the foot of a hill. The busy road is fringed with houses and service roads, a fume-blackened anti-pedestrian fence along the central reservation. Immediately after the crossing I'm on a bridge over the Dollis Brook, a broad and proud stream which unfortunately, today at least, reeks of sewage and decay. There is a pleasant looking path alongside it, well-signposted and inviting. I log the details for future wanders and press on uphill along Finchley Lane, a long and slow climb through fairly featureless residential streets. Along the way I spot the bus stop for 'Crooked Usage' and can't relate it to any local streets or features at first. Curious to research the unusual name later, I snap a picture and move on, feeling the net curtains of Finchley twitching behind me at my brazen display of odd behaviour. It is perhaps premature perhaps to say Finchley though, as I'll never quite get there... My route makes a sudden turn south along Gravel Hill to a crossroads with another road to Finchley which the signs also claim is the A504. No maps seem to agree, so after spending a moment pondering whether the completist in me needs to make a detour along this spur, I resolve not to be diverted. Thatcher country can wait for another walk along another road. Instead I continue into the rather prematurely named 'East End Road', a considerable length of which fringes a Cricket training ground named for Wilf Slack - the Gambian batsman who thrilled Middlesex fans in the 1980s before a shocking early passing. Across the street from these well-kept greens is the New North London Synagogue. I'd noted the smartly turned out families across Hendon and Finchley heading for their Shabbat morning services, but this was an altogether larger enterprise, attracting a seemingly much bigger congregation. I also noted the presence of considerable security along the high brick wall which fronted the site, and only a sense of decorum prevented me from photographing the curious site of a muscular, white-shirted guard cracking his knuckles menacingly in a stab vest and a yarmulke. There was a sense of tension alongside the fine clothes and family groups this morning which was sobering to a visitor from the comparatively rural west country. I could hear the rush of fast-moving traffic up ahead but the source wasn't immediately evident. As I approached a deserted bus loop and a windswept public park, I realised that the tunnel carrying the North Circular was directly beneath me. Crossing to the southern side of the road, I could see the broad carriageways emerging from a surprisingly decorative brick tunnel mouth with Middlesex county crests built into the brickwork. I paused a while to contemplate the walks which I'd need to undertake to cover this lengthy, deeply polluted beast of a road. I'd navigated considerable parts of its tortured circuit on foot already, and it had been a constant presence in my walks over the past year or so - but it needed to be considered as a whole at some point. I figured it would all too soon be time. But now I had other business, and pressing on alongside the huge East Finchley Cemetery - which seems to have a tennis club embedded rather optimistically within the grounds - I entered a somewhat gentrified zone leading into East Finchley where the older route of the Great North Road crossed my path. As people strolled around with purchases from the rather fine butchers shop and bakery, I spotted a young gent in rather snug shorts using a state-of-the-art cordless vacuum cleaner to hoover up stray gravel from his driveway which also featured a huge 'Vote Labour' sign. It felt like a defining image for the maelstrom of an election campaign which was being waged across the country now. None of the parties seemed to occupy their rightful places just now. All was confusion. Blame Brexit, blame immigration, blame everyone except the often wilfully perverse voting public. East Finchley becomes Fortis Green - which may or may not be an suburb in its own right - and hereabouts the London Borough of Barnet gives way to Haringey. Not a great deal changed - the long straight road was lined with pleasant terraces, the occasional set-back cottage behind a leafy hedge, and local businesses and pubs. Traffic was a little quieter here, and only the occasional TfL bus stop reminded me that I wasn't in almost any other provincial market town. As I continued east, a sense of London returned in the long parades of victorian shop fronts and sizeable blocks of early public housing schemes. 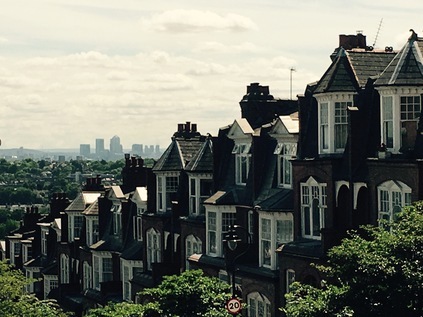 The broad avenues leading south from Fortis Green led towards a distant vista of Highgate Wood, a splash of green under a cloudless blue sky. It was easy to love these surroundings, and I'd have happily walked here for longer hadn't the call of coffee been strong. I was approaching Muswell Hill - a district I'd briefly skirted when walking the former Northern Heights railway line, but which I didn't know well. As I was following the A504, my approach was via Queens Avenue - an impressive crescent of terraces which were clearly far too big for modern dwellings, and which had been divided into flats some time ago. The splendid buildings looked decently built but sadly run-down, a forest of wheelie-bins cluttering the front yard of each, and a truly remarkable amount of fly-tipping in evidence. As I marked the curve towards the centre of Muswell Hill, stepping over microwaves and around mattresses discarded on the pavement, I wondered if perhaps my preconceptions about the area had been wrong after all? They hadn't. Once I reached the epicentre of Muswell Hill - focused around a five spurred roundabout housing a bus stand - I saw that it was just as I'd expected. This bustling zone was a distinct small town, and the crowds which wandered in the midday sun were predominantly almost sickeningly happy, healthy and prosperous looking young families. As fathers hefted curious children onto their shoulders to sway through the crowds, a loud and engergetic Labour Party campaign stand was drawing attention. Hornsey and Wood Green has flipped between the main parties over the thirty years that it has existed in its current configuration, but it seemed that local activists were doing their utmost to see that Catherine West held on this time. I explored the town centre a little, until I found a coffee shop and took a quick break in the cool, dark air-conditioned comfort. Outside, the electioneering went on as loudly as ever. For the first time in this short, sharp and rather bitter campaign I began to doubt the result would be as clear as it had seemed at first. Moving on, I took the south-eastern exit from the huge roundabout and confronted Muswell Hill - the steep, long road leading down from the northern heights towards the lower-lying lands around the Lea Valley. Reputedly the steepest hill in London, it commands an impressive view towards the Isle of Dogs, and I tried to capture it on camera before realising that I wasn't going to do this scene justice at all. Instead, I gingerly set off - walking downhill is of course always preferable to heading up, but it has its own special perils for a clumsy, heavy footed walker like me. I took things steadily, letting gravity do just enough work - and working hard to stop it doing more than I'd like! Soon after setting off down the hill I spotted the underpass where the former railway crossed under the hill on route from Alexandra Palace to Cranley Gardens. Muswell Hill is surprisingly ill-served by rail nowadays, and while it figures in a good number of bus routes, it's a hike from the nearest station. Perhaps, given the evident prosperity in the area, the Northern Heights plan hadn't been such a bad one after all? I continued down the hill, the impressive front of Alexandra Palace appearing over my left shoulder, with the tall antenna pricking the blue sky beyond. My last walk here had been misty and strange - but I hadn't quite appreciated how fine the views were from up here. Beside me, cyclists struggled against the gradient, determined to make the ascent in one effort. After reaching the bottom of the hill with a little relief that I'd done so firmly on both feet, my route turned east towards Hornsey. This was an area that I had only a theoretical sense of - a railway depot, a former Borough, a station. 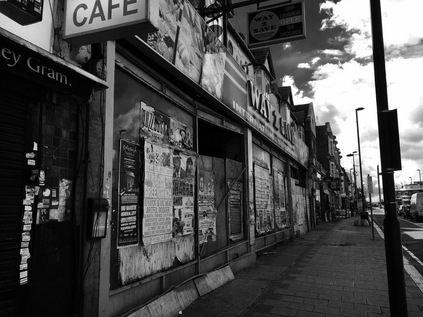 Haringey is always described as a borough of contrasts - and the first noticeable difference was that in this lower-lying eastern part of the area, the population was far more diverse. The sea of almost entirely white faces up on Muswell Hill now seemed rather oddly homogenous. The area was also however, much less prosperous looking and felt a little down-at-heel. Street furniture wasn't repaired nearly as consistently, there were more empty shopfronts, the streets were less well-cleaned. The benefits of living in a vocal, educated middle class suburb were starkly apparent - but Hornsey High Street went about its business with pride too, and I confess to feeling much more comfortable ambling along this stretch of curious stores and patches of unexpected green space than I had while lingering in Muswell Hill. At the end of the High Street, the road passed under the East Coast Mainline with the New River skirting the foot of the viaduct. 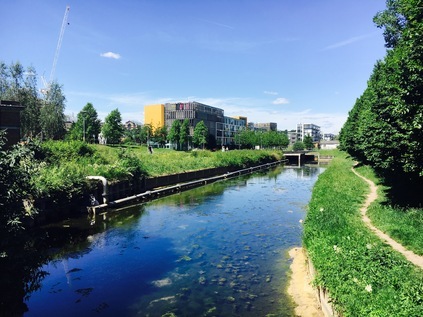 To the north, the river ran in pleasantly landscaped surroundings with new offices and apartments set among the buildings of the Victorian pumping station. Beyond the road to the south, the river disappeared into a graffiti-covered underpass surfacing east of the railway. The temptation to turn north and walk the river path was strong as ever, but having passed the midpoint of this route there was no way I'd turn aside. From the bridge, my path continued east as Turnpike Lane - a long terrace of victorian villas fronting up against a run of cash-and-carry outlets and restaurants. Some of the terraced homes had built their fronts out to the pavement forming makeshift stalls selling exotic fruit and household appliances. The street throbbed in the heat, low beats shuddering waiting cars while people hung around on the pavement, far too warm to be in the heat inside their premises. Glancing along the streets leading north as I crossed them, I spied the totemic 'M' which topped the Mall at the former Wood Green Shopping City. It dominated the surrounding area in an oddly menancing way, breaking the suburban pattern. This also meant that I was nearing the crossing of Green Lanes at a spot I'd visited on a number of occasions. Not least when I'd traced the mysterious Moselle River in so far as it can be found nowadays. The origins of this stream in Muswell Hill weren't lost on me during todays walk, but it's hard to imagine where it might have flowed before the arrival of this busy jumble of streets. The junction of Green Lanes - or at this point Wood Green High Road - with Turnpike Lane was as ever a chaotic and frantic tumble of people. It was hard not to get swept up in the crowd, carried across the road and into the Underground station with the greater mass of people. Young shoppers laden with bags tottered along, achieving one-thumbed text message composition as they went. Drivers edged around the corners of the junction as pedestrians blindly strayed into their path. Buses shuddered and lurched away from the stops, urgently sounding horns at people who just couldn't wait to pass in front of them. Despite following a suburban A-road, here the pedestrian had asserted unofficial authority. I turned south then west, passing the routes I'd taken before in pursuit of the river, and heading into West Green Road. This involved crossing an area of the map I'd not traversed, closely shadowing the former Palace Gates railway line which had branched from the Great Eastern Mainline at Seven Sisters. I realised as I progressed along a suburban street not hugely different to others I'd encountered today, that I'd only ever crossed this zone between the main arteries of Green Lanes and Tottenham High Road by rail, despite walking the radial routes into the city many times. Perhaps this series of walks which cross the territory are long overdue? West Green was in some ways a revelation - a large African and Caribbean community made for a bustling, loud and surprisingly interesting walk, the suburbs soon giving way to a busy if officially unremarked High Street where a dizzying range of cuisines and ingredients could be found along with a vast over-provision of barbers, phone unlockers, money wiring services and apparently makeshift garages. Along the way I paused close to the sliver of Downhills Park which reaches south to the road along the old railway curve, and listened to an animated preacher belting out her witness near the war memorial. Meanwhile, across the street the congregation of the Seventh Day Adventist church were spilling into the street - a busy tumble of beautifully dressed people filled with fervour and excitement which the church, apparently converted from a suburban home couldn't contain. It was time to make once last push into Tottenham and beyond - but I was almost sorry to be leaving West Green where life appeared to continue regardless of London's swirl and bluster just on its fringes. Spotting a tell-tale rise in the road, I briefly detoured south onto Avenue Road where a bridge parapet still betrayed the route of the Palace Gates branch, now in-filled with modern low-rise housing. Further east, where the rails from Liverpool Street crossed above, the site of the former entrance to Seven Sisters Station was evident, a tumbledown newspaper shack occupying the old stairwell. The entrance had moved to more salubrious streets when the Victoria Line arrived in 1968. West Green, marooned between railways but with no station of its own, persisted nonetheless. I crossed Tottenham High Road near where my recent A503 walk had intersected it at Page Green. The reputed site of the ancient ring of trees known as the Seven Sisters now housed a ventilation shaft for the Victoria Line, the trees clustering around it in a mockery of the legend. Broad Lane continued the A504 beyond the High Road into the surprisingly quiet hinterland. I could sense the River Lea close by, my route having flattened out as it crossed the wide floodplain. Traffic was sparse, and apart from an eager religious leafleter, I was one of only a few pedestrians out in the strong sunshine. With industrial buildings looming ahead, the road took a sharp turn to the north and suddenly I was in the familiar territory of Tottenham Hale Retail Park. The shiny metal and glass units reflected the heat back at me as I passed between them, noting that on the other side of the street an old fashioned second hand shop was doing fine business on a corner. At Tottenham Hale station, my road ran out - merging into the A503 as it ploughed on over the Lea towards Epping Forest - a route I'd already taken. Navigating the complicated redevelopment of the station to find my platform, I reflected on my walk as I waited for a train back into the city. Hendon seemed so distant and alien to this familiar landscape - but on the way I'd passed through what seemed like unremarkable suburbs, all of which had left surprisingly individual and different impressions on me. The gradual ascent to the heights followed by the sudden descent into the Lea Valley felt a little like coming home - back onto comfortable territory - but it suggested so many other walks which called for attention. As the country sat on the brink of an unexpected election, basking in an equally surprising summery weekend it was hard not to feel a little flash of optimism for London and its future. The train was late, but I was happy to spend a few more minutes watching the world pass by out here. A gallery of images from the walk can be found here.